The Quebec Resolutions received a mixed response from the various colonies of British North America. 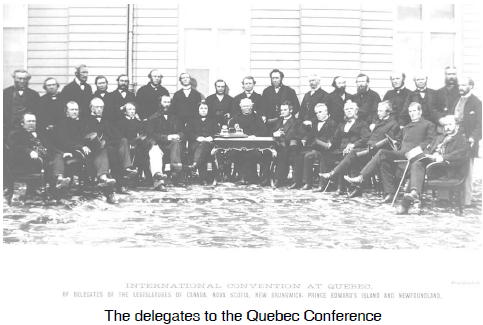 The delegates to the Quebec Conference had considered putting their resolutions to a popular vote, like the Referendum of 1992, but decided against it because they feared that the Confederation idea would be defeated. Instead, they said that the resolutions should be put to a vote within each provincial legislature. Here the provincial government leaders usually had majorities and could depend on a positive vote. Many French Canadians, particularly the Rouges party, opposed Confederation because, in the new House of Commons, English Canadians would greatly outnumber the French. There was also strong opposition in the Maritimes where many people felt that their trade orientation was more north-south with the United States and eastward with Britain. They feared loss of their special identity, too. The resolutions passed in Canada East by a narrow margin and in Canada West by a definite majority. Canada West had the most to gain from union. New Brunswick initially opposed Confederation, defeating Confederationist Leonard Tilley in an election, but Tilley returned to power in 1866 in time to put it through. In Nova Scotia, Charles Tupper urged a quick completion to Confederation before his government had to face an election, since the feelings in that province, expressed by people like Joseph Howe, were not enthusiastic. In P.E.I. there was so much opposition to Confederation, across party lines, that the province stayed out of the 1867 agreement.